Hanover Brazil works directly with Brazilian manufacturers and exports a broad range of replacement parts for Caterpillar, Cummins, GM, Mercedes Benz, Volvo, Scania, Ford Tractor, and others. 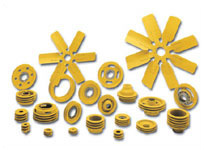 Most component parts can also be developed to client specifications. Wheels, hubs, brake drums, suspension parts, pins, fans, pulleys, radiators, oil coolers, bushings, headlights and other lighting, manifolds, elbow, seals, hundreds of fabricated parts, castings to spec for any application, machined parts, laser cut parts. Hanover has manufacturing associates with strong capabilities in ductile and gray iron castings, machined parts, fabricated parts, lighting, manifolds and exhaust parts, radiators and oil coolers, laser-cut parts, and others. Please contact Hanover Brazil for quotes on any component parts and we will quickly provide you with answers on production and pricing.